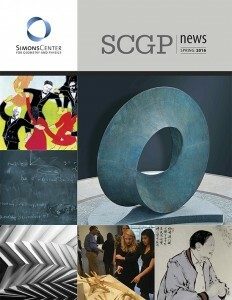 The Simons Center for Geometry and Physics is pleased to announce the latest issue of SCGP News, a biannual publication which reflects the Center’s mission, scientific and cultural events. In this issue the Founding Director, John Morgan, recounts the Center’s early days, the power of transversality, and more. SCGP Professor Simon Donaldson contributes an elegant mathematical vignette. 2014 Fields Medal laureate Martin Hairer, the sole organizer of the Simons Center workshop on Stochastic Partial Differential Equations, shares his opinion on the funding of mathematics, talks about his interest in sound and the creation of his Amadeus software. We encourage you to read about the latest exciting edition of the Della Pietra Lecture Series featuring Tadashi Tokieda and watch videos of his engaging talks. In this issue we celebrate Professor of Mathematics Tony Phillips’ life at Stony Brook University; listen to his story of the golden days of Stony Brook University Mathematics, learn about his interest in labyrinths, tides, and his use of Hairer’s Amadeus software for recording birds songs. The issue also delves into the pioneering research of the Center’s programs and workshops, Art Program events, offers a new puzzle by Alexander Kirillov, as well as fascinating cooking tips from the SCGP Café’s Chef Paolo Fontana and … from Martin Hairer! View our current version of SCGP News, Vol VIII HERE! View our past newsletters HERE!